This is a minor artifact I worked up for Jeff Rient’s open call. Zarmon was a great smith, maybe the greatest smith in the world, or perhaps in all the Motherlands. This is a point of dispute among sages and was a point of honor to Zarmon when he yet drew breath. One winter, in the depths of the twilit season and in the throes of a pernicious melancholy, Zarmon resolved to seal his fame and forge a magical weapon, a sword. As a master smith in great demand, he had many opportunities to consult with great mages, and peppered each one who walked into his workshop with questions about the forging of magical things. While most had not the skill or knowledge to help him, a few truly learned men and women advised him that his endeavor must end in failure, for he had no command over things arcane. Finally, one archimage (possibly the magnificent Baloc) told him that, indeed, an enchanted weapon was not beyond his abilities if he was completely dedicated to the task. He would have to forge the weapon in the presence of raw elemental power and mingle his own blood, his own soul, with the weapon. Following Baloc’s instructions, Zarmon moved his factory and household to the southern island of Taprobane, to a place where hot magma flowed into the pounding surf. There, on a windswept ridge, he constructed a forge and began working on his sword. For a year and a day he worked at refining the steel and folding it, pounding it every day with his trusty hammer, firing it in the flowing magma, quenching it in the pounding surf and anointing it with his very lifeblood. For a year and a day he poured his every waking moment into the sword, the great sword, the greatest sword forged by mortal man. And on the final day of his task, at the completion of his work, he laid his hammer on his anvil and held aloft the unadorned blade and watched it cut the wind and throw the sunlight off its back and a tremor shook Zarmon. He dropped to his knees, gasped a final breath, and toppled with his masterpiece into the flowing magma, and smith and sword ceased to be. All that was left of Zarmon the Smith was his old, trusty hammer, with which he had forged a thousand swords and known a thousand joys and sorrows and built for him a reputation as a worker of wonders. Zarmon the Smith did not leave behind an enchanted sword for the ages, but he did leave an enchanted hammer that passed into the hands of his sons and made them almost as great as their father, and then passed into the mists of time when their workshop on the shores of Taprobane was sacked by pirates. The hammer exists to this day, looking for all the world like an old smith’s hammer and still working wonders in steel. 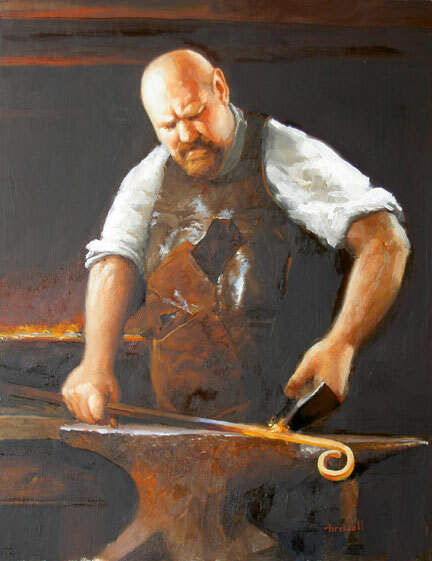 Art: The Smithy by Martin Driscoll. Very well done. Poor Zarmon, for all his hard work to have gone unrecognized and his masterwork lost . . . or was it?